Elephant Revival is a unique quintet of multi-instrumentalists blending elements of gypsy, Celtic, Americana, and folk. Brought together by a unified sense of purpose, Elephant Revival communicates the importance of harmony among all living things and use music to unite us in ways that no other medium can. That simple line atop Elephant Revival’s Facebook page contains only five words, but reveals volumes about the band’s reason for being. Music unites us in ways that no other medium can. Even when we don’t understand one another’s languages — we can be moved by a rhythm, soothed by a song. Brought together by a unified sense of purpose — the spirit of five souls working as one, in harmony, creating sounds they could never produce alone. 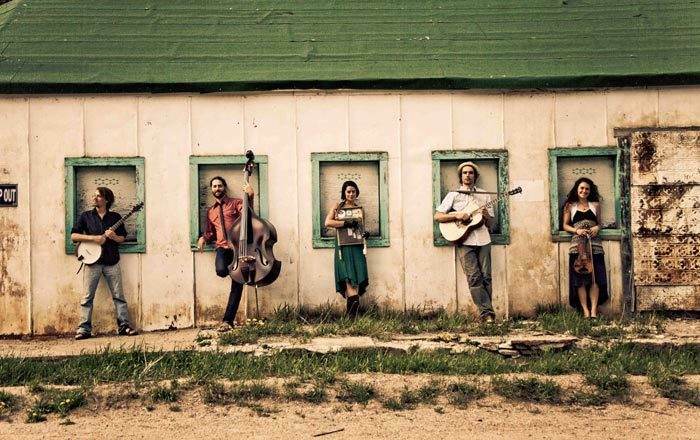 The five souls in Elephant Revival are Sage Cook (banjo, guitar, mandolin, tenor banjo, bass and fiddle); Bridget Law (fiddle, octave fiddle); Bonnie Paine (washboard, djembe, musical saw, stompbox); Daniel Rodriguez (guitar, banjo, bass); and Dango Rose (double-bass, mandolin, banjo). All share vocals and write songs. Paine delivers additional beats via footstomps on plywood, her stockinged feet doing near jigs as her hands, encased in antique leather gloves, rub silver nickel against corrugated metal. This Nederland, Colo., quintet are, needless to say, quite a sight to experience — especially when they fall into the pocket of a groove containing elements of gypsy, rock, Celtic, alt-country and folk. The Indie Acoustic Project simply labels their sound “progressive edge.” At least, that’s the category in which it placed the band when it gave their Ruff Shod/Nettwerk Records release, BREAK IN THE CLOUDS, a best CD of 2011 award. It’s as good a label as any to convey what Rose has described as their mission: “to close the gap of separation between us through the eternal revelry of song and dance.” Elephant Revival also shares a commitment to responsible stewardship of the planet and its inhabitants, working with organizations such as the Conscious Alliance, Calling All Crows, Trees Water & People, and other nonprofits supporting humanitarian causes. Their very name was chosen out of empathy for a pair of zoo pachyderms who, upon being separated after 16 years, died on the same day. The band related that heart-rending story during their April 2012 debut on fellow Coloradoan Nick Forster’s internationally syndicated “eTown” radio show — like Elephant Revival, a blend of music and social consciousness. Sitting in the audience during their performance, one music blogger was moved to write, “Elephant Revival serenaded the crowd with arabesque melodies, harmonies and rhythms that braided and coiled into a sublime aural tapestry. Their instrumental dynamics, verse, and even the harrowing story that inspired their appellation, invoked the majesty, mystery and sorrow of Mother Earth.”Campout for the Cause festival organizers put it this way in an affectionate shoutout on their Facebook page. “We love Elephant Revival so much,” they wrote, “not just for their incredible music and conscious lyrics, but for their commitment to living up to the standards they set forth and setting positive examples.”It’s a paradigm worth spreading, and that’s what Elephant Revival members intend to continue doing as they carry their music around the world, speaking one song at a time.